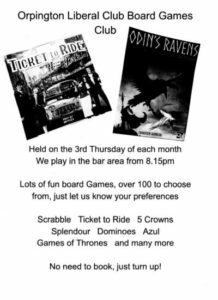 A regular 3rd Thursday in the month friendly fun event in the OLC Bar area. Lots of board games available to choose to play ranging from the familiar to the obscure. Everyone welcome ..It’s free entry to OLC members ..£1 temporary membership charge to non-OLC members.